In Australian media news this week, the out-of-home industry posts a 10% revenue increase year-on-year, Woolworths launches its first digital edition of Fresh, record-breaking cinema box office sales kick off 2015, and reports Twitter plans to sell advertising on tweets embedded on other websites. The Australian out-of-home industry increased its net revenue by 10% year-on-year, reaching $602.1 million in 2014. The industry has been growing for five years now, since recovering from the GFC in 2010. The OMA says results are showing OOH audiences growing. In 2014, Move reported 400 million total daily contacts, up 3.6% from 386 million in 2013. “People are travelling further each day and spending an average of 14 hours travelling and shopping each week. In light of this, Australians are now likely to see an average of 26 advertising faces each day,” OMA says. 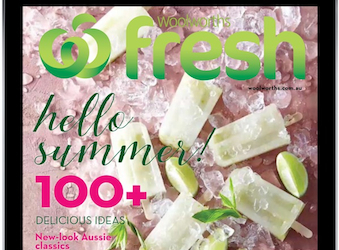 Woolworths has released the first digital edition of its free customer magazine Fresh, complete with an integrated online shopping cart allowing readers to add ingredients from recipes as they read. the ability to save favourite recipes and articles to read later. Fresh is Australia’s most-read magazine, with 3.2 million readers, ahead of Better Homes and Gardens and The Australian Women’s Weekly. The first two weeks of 2015 was the strongest on record for cinema, up 18% year-on-year, according to Val Morgan. Movie-goers spent more than $40 million across each of the first two weeks of 2015 to see films including The Hobbit: The Battle of the Five Armies, The Imitation Game, Penguins of Madagascar, Taken 3, The Water Diviner and Big Hero 6. The success surpasses the 2010 record set by Avatar, which “redefined box office records globally”, Val Morgan says. The Wall Street Journal is reporting rumours that Twitter is planning to expand its audience available to paid advertisers by selling ads within streams of tweets embedded on other publishers’ websites. “People familiar with the matter” told WSJ that the company announced its idea at the recent Consumer Electronics Show (CES) in Las Vegas. The plan, if implemented, would significantly boost the social media company’s revenue.